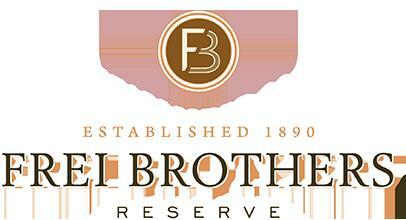 Rooted in an unwavering dedication to sustainability, Frei Brothers Reserve wines are a pure expression of the land. Winegrower Jim Collins begins by selecting the growing region that is best suited to a particular varietal to craft a collection of award-winning Sonoma County wines. Founded in 1890 by Swiss immigrant Andrew Frei, Frei Brothers Reserve has been instrumental in establishing Sonoma County's worldwide reputation as a premier winemaking region. Today, Frei Brothers Winery is a certified participant in the California Sustainable Winegrowing Alliance. For more than 30 years, Frei Brothers has maintained a deep commitment to sustainability, both by preserving natural resources and upholding the quality of its wine – for today and for generations to come. "Frei Brothers Russian River Valley Pinot Noir offers a fruit forward expression of the Russian River Valley. A combination of dark blue fruit characteristics and bright red fruit notes, this wine offers flavors of boysenberry, pomegranate and cherry, framed by hints of lavender, vanilla and clove." " Our Frei Brothers Russian River Pinot Noir offers a fruit forward expression of the Russian River Valley. A combination of dark blue fruit characteristics and bright red fruit notes, this wine offers flavors of boysenberry, pomegranate and cherry, framed by hints of lavender, vanilla and clove. " "Winemaker Notes""Our Frei Brothers Reserve Alexander Valley Cabernet Sauvignon opens with aromas of earthy cigar box and ripe plum, framed by toasted oak undertones. On the palate, flavors of blackberry, black currant and tea leaf culminate in a complex finish with velvety tannins." An exemplary expression of the Dry Creek Valley, this well-structured Zinfandel opens with notes of ripe, black cherry and raspberry jam. Rich mocha and caramel flavors meld with a touch of cedar and spice on the palate, culminating in a lingering, fruit-filled finish. Wine Spectator 92"Combines firm, dark fruit and chewy tannins with a measure of finesse and refinement. Ends with gripping, cedary tannins, bolstered by good length and depth." " Frei Brothers 2011 Russian River Valley Chardonnay is a soft and complex reflection of one of Sonoma's most renowned cool-climate regions. This wine has great varietal character, with sweet aromas of toasted oak and butter, balanced by flavors of ripe green apple and delectable baked apple pie.